Apologizing too much can be problematic. It is important to note how often you apologize and why you do so, and determine if it is really necessary or if it is just a habit. Let’s say that you promised to pitch in with your child’s PTO—but haven’t had a second to spare. Or maybe you volunteered to help with a project at work—but the deadline is looming and you’re no nearer to completing it than you were months ago. More often than not, you hear yourself uttering, “I’m sorry” during the day for all the things that you’re not doing right or finishing. Studies have shown that women have an easier time apologizing than men—and do so with greater frequency, too. And even though it’s good to apologize when you’ve done something wrong, it’s not in your best interest to say you’re sorry all day long, either. Here are some ways to combat the urge to say, “I’m sorry,” and say it only when you really need to. Chances are that you don’t even realize how many times during the day you’re actually saying that you’re sorry. So keep track of how often you’re in an uncomfortable situation and subsequently respond by apologizing. You can take it one step further by writing down the number of times you’re apologizing—and for what. That way, you can see how often you are actually apologizing. You may be shocked at the number of times you’re saying you’re sorry without even realizing it. Your boss sends you a second request for information that you should have sent her a few days ago. Your immediate reaction: Apologize profusely in the first line of your email—complete with capitalized letters and exclamation points. But a better option might be to take a second look at the email and think of another response. While your first instinct might be to apologize, sometimes, surprisingly, an apology is not necessary. Instead, respond by saying that you will send the information she requested—ASAP. Take another look at the list you’ve created with your daily apologies and see what you’re actually apologizing for. Maybe you’re sorry for all the times you turn in your assignments late; or perhaps you offered to help one of your virtual colleagues with a project, and then forgot to follow up. Whatever the reason, you’ll need to take the steps to reclaim your time and your energy. If you take on too many tasks, limit your to-do’s to only what you really need to get done. 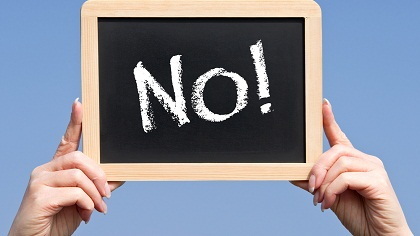 Learn how to say no (and mean it!) when someone asks you to volunteer your time and energy for something that you can’t accomplish or simply don’t have time for. Not having to apologize later on will make you feel much better about yourself in the long run. By assessing what you’re doing wrong, you can figure out how to make things right—no apologies necessary.